One of the latest Japanese robatayaki to hit our F&B scene in Petaling Jaya is Manmaru Robatayaki & Bar. Located in the newly renovated Atria Mall, Manmaru Robatayaki & Bar is the latest offspring of Manmaru Homemade Udon. While the other one specialized in udon, this one highlights Japanese robatayaki or BBQ together with a compilation of modern Japanese cuisine fused with Italian touches. Manmaru Robatayaki & Bar has definitely elevated Japanese cuisine to a whole new level of couture dining. The ambiance is modern contemporary with splashes of Japanese touches. Beautifully elegant with clean lines of dark furniture matched with rustic dark steel, even the robatayaki bar is a gorgeous centerpiece of attraction. The huge architecture of box lighting at the bar compliments the whole ensemble majestically. Other lights of various shapes of spotlights added more art to the whole restaurant. There are different sections of dining as well as private room for dining. Overall, their ambiance matches what Manmaru Robatayaki & Bar is offering in the menu to a ‘T’. The freshest catch imported from Japan is displayed on the bar from various premium fishes to king crab, scallops, wagyu and more. These comes with a hefty price tag but at least one does not need to fly all the fly to Japan to savor fishes such as Chidai, Kinki, Aka Tsaki, Kinmedai and Taraba Kani. When it’s listed as a bar, you know there will be plenty of bar beverages to amp up the dining experience. The bar menu is long and filled with loads of house pouring liqueur, cocktails, beer, sake, shochu, fruit liqueur, wine, non-alchohol beverages, juices, smoothies and more. That evening, we were gaga over their cocktails! 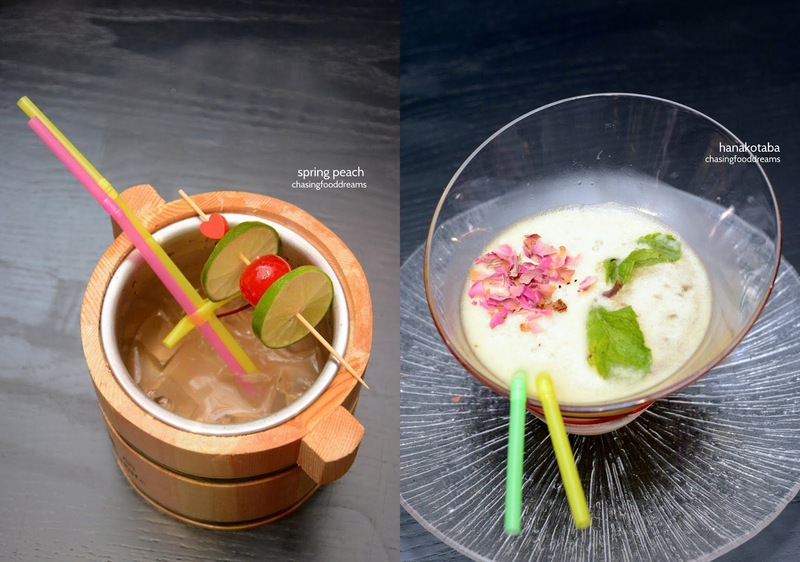 Manmaru’s cocktails is simply gorgeous at sight and beautifully delicious in flavours. 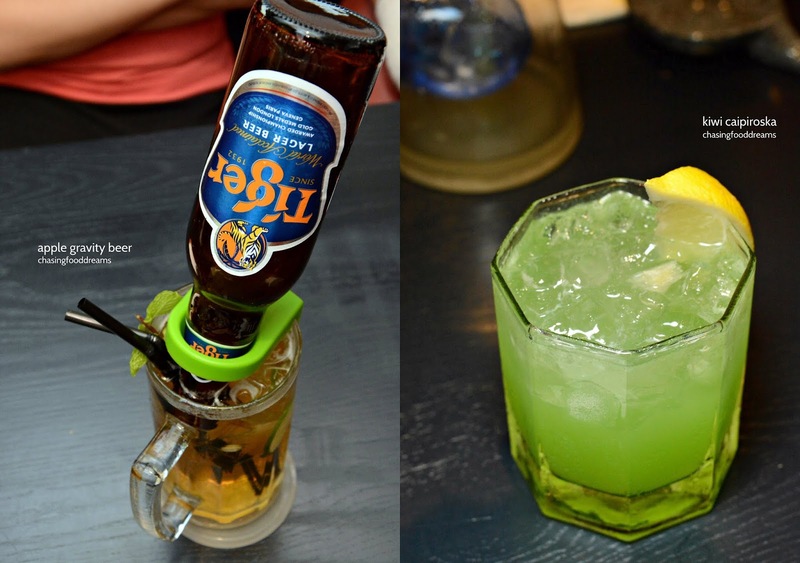 Apple Gravity Beer (RM28) is a one of its kind uneven gravity beer scientifically balanced in the air upside down paired with sweet and sour cocktail concoction. Kiwi Caipiroska (RM35) was refreshing, tangy and fruit. Spring Peach (RM25) showed that vodka and sake matches well! So pretty with crushed dryrose petals and mint on creamy foam, the cocktail Hanakotaba (RM30) is simply dainty and delicious. Dinner menu is impressive with a large selection of Seasonal items, Robatayaki, Appetizer, Salad, Sashimi, Sushi, Makimono, Fusion Sashimi, Grilled Dishes, Deep Fried Dishes, Teppanyaki, Sauteed, Steamed, Braised, Hot Pot, Rice & Noodle Dishes and more. There is practically a dish to satisfy diners of all ages. If you are game for surprises, Manmaru Robatayaki offers two choices of Omakase Course where Chef Executive Chef Danny Leow whips up his specialties based on the freshest seasonal ingredients of the day. Choose from a 7-course Omakase (RM280) or 5-course Omakase (RM180) with a minimum order of 2 pax. Unagi Karaage (RM40) was the first appetizer to arrive and it was served in cup with sesame dressing. Crispy batter enveloping juicy tender eel pieces are further enhanced by creamy aromatic sesame dressing. This one makes a great snack with beer and cocktails! If all salads are this pretty, I am sure I would eat more of them. Coral Bash Salada (RM18) is a dish of fusion potato salad taken to couture levels of presentation. It’s literally a garden of potato salad fused with lots of special treats of seafood and caviar with two sauces. This one will definitely have diners admiring it for a while before savoring it. Salmon Tataki Salada (RM35) is another garden of flavours. Slices of succulent salmon lightly seared tataki style is crowned with greens on a pool of tangy spinach dressing. Simply delectable! Gyoza Kawa Age To Magura Salsa (RM28) has a tasty tuna salsa paired with gyoza chips. I like the dish for its simplicity and flavours. Obviously presentation is a crucial element of Japanese cuisine and Manmaru’s team has certainly taken their food presentation to a whole new level of impressiveness. Chef Danny and team got really creative and the presentation of each dishes kept us on our toes in excitement through the night. Kushiyaki Moriawase (RM68), was what Manmaru Robatayaki is all about. Skewers of yummy grilled meat, seafood and vegetables are artfully presented. One can enjoy this Kushiyaki Moriawase with assorted skewers or simply order them a la carte with 3 skewers per order. Choose from various chicken parts, beef, scallops, salmon, smoked duck and more. My favorite was the Tsukune of minced chicken balls and beef. We also had a beautiful rock fish of Grilled Kasago (seasonal price). The flesh is very fine and sweet with a lovely chargrilled aroma. Besides the grilled skewers, Manmaru Robatayaki other highlights include their sashimi and sushi. The menu boast a solid list of regular and premium cuts of seafood. Choose a la carte or their set platters. 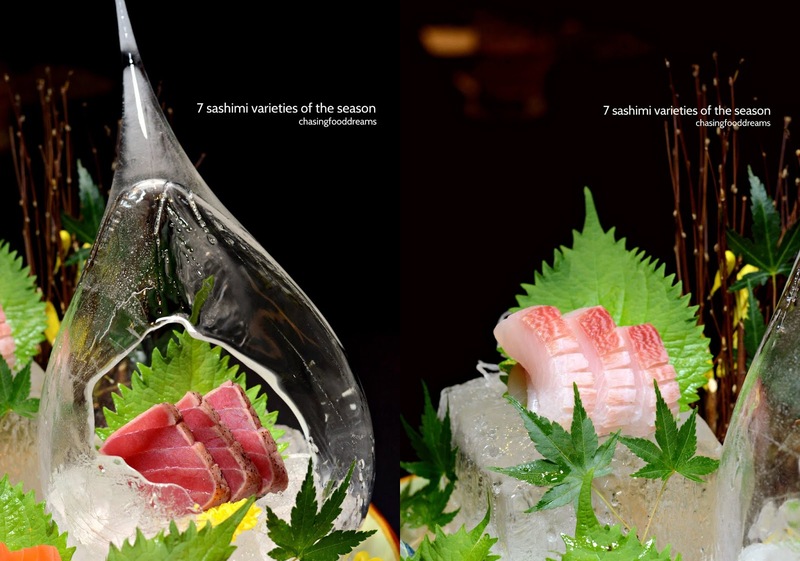 We had their 7 Sashimi Varieties of the Season (RM210), a stunning bowl of superior cuts of sashimi. A wondrous taste of sashimi with oceanic sweetness! Another masterpiece that deserves much attention is the Wagyu Roll (RM68)! Look at the sheer beauty of the wagyu beef marbling. Beneath the blanket of wagyu is a ball of warm rice studded with bits of fatty beef lightly cooked. Edible gold added opulence to the wagyu. Dollops of various sauces created a garden with edible flowers and herbs. The warm rice is perfect with the melt-in-the-mouth wagyu, creating savory and moreish pleasures on the palate. More sushi came in the form of maki rolls and these are no ordinary rolls. Indulge in the king of crustacean, the Lobster Roll (RM68) with lobster meat, mango, cucumber, salmon roe and masago. The sweet lobster meat paired well with sweet fruity mango slices while salmon roe added briny salty notes together with masago eggs. The Volcano Roll (RM38) has a spicy rendering of salmon roe, avocado, crab meat, cucumber and spicy sauce. Each cut of maki roll is drenched in a volcanic looking sauce lightly torched for a smoked note. Spicy, sweet and so delicious! Sakana Kami Yaki (RM58) is translated into grilled snapper with beef bacon and seaweed baked in paper with a creamy sauce and mustard. It’s quite unique to pair fish and bacon but it’s the sauce that ties both together in the dish. I like the addition of seaweed as it gave the dish a nice nutty aroma.The salty briny olives also helped to cut the richness of the sauce. Cream Korokke (RM22) translated to seafood cream croquette. Crispy and golden exterior with creamy and tasty center, it had all the passing marks of a good croquette. Ishiyaki Kaisen Chahan (RM23) was so good, we had a reorder. Seafood garlic fried rice served in hot stone bowl turned out to be one of the ultimate dish for us that evening. The crispy crust on the bottom of the fried rice was scrumptious while there were also plenty of seafood bits to keep us very happy and satisfied. Must- order!! We finished the evening with housemade ice creams of Yuzu Ice Cream (RM12), Matcha Ice Cream (RM10) and Kuro Goma Ice Cream (RM18). My favorite was the tangy and refreshing Yuzu Ice Cream. Manmaru Robatayaki & Bar is certainly the Japanese restaurant to watch out for. It’s got amazing dishes with excellent presentation. There’s just so much potential for Manmaru Robatayaki & Bar as one can certainly be impress or impress someone else with such a couture Japanese dining experience. Prices are higher than average but rest assured, you’re getting what you are paying for with the quality of the food and presentation. Simply unforgettable…. man, this really looks amazing.